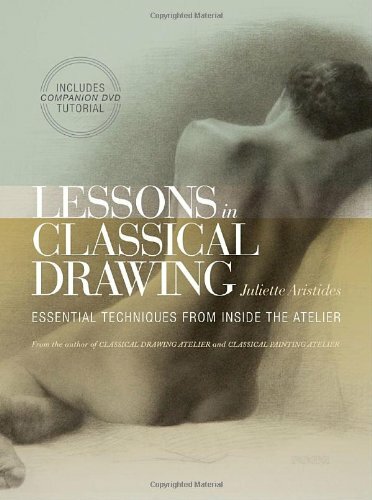 This is a wonderful book on drawing by Juliette Aristides. It covers the essential techniques to making a good drawing. These are subjects like understanding lines, contours, proportion, depth, tonal composition, light and shadow. They are the usual subjects taught for drawing. The text is insightful and filled with tips, supplemented by beautiful illustrated examples from artists and old masters. This is not an immediately hands-on book where you can dive in and draw straightaway. It focuses on the understanding of different techniques. After which, each chapter ends with a guided practical lesson on learning points. The book also comes with a DVD containing 1 hour of video with Juliette Aristides demonstrating what was taught in the book. It covers blocking in general shapes before defining them with more detail, and finishing them up with tones to give the illusion of light and shadow. The video reinforces the drawing techniques as used in real life. This is a well written and presented book. It's really insightful. Highly recommended to anyone learning to draw. A great value for money.